A Bank Teller is accountable for assisting customers by answering questions, processing transactions and handling all types of clerical and administrative duties. 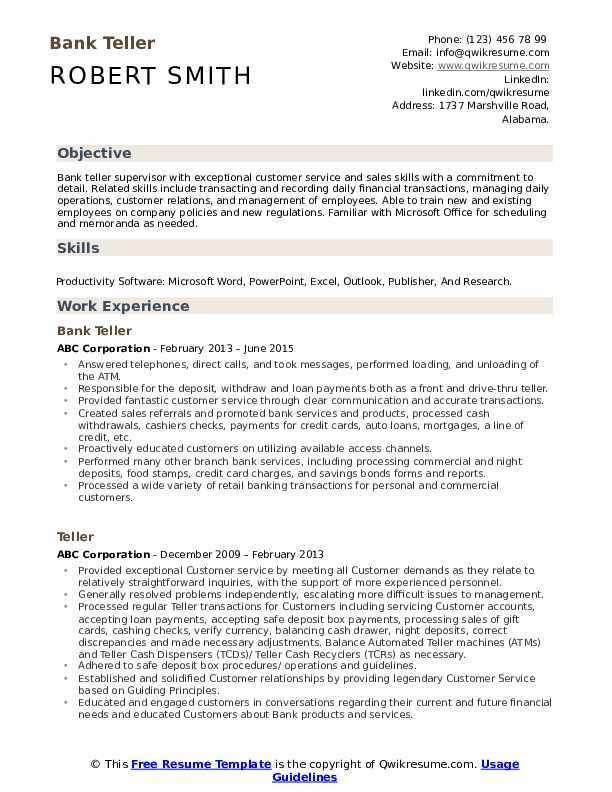 A well-drafted Bank Teller Resume gives a list of the following duties and tasks – assisting customers in tasks such as depositing cash, withdrawals and payments; resolving customers complaints, informing customers about bank products, tracking and storing information related to bank transactions, balancing cash drawers and reconciling discrepancies, handling currency and all confidential information responsibly, using relevant software for tracking bank information and following bank financial and security regulations. 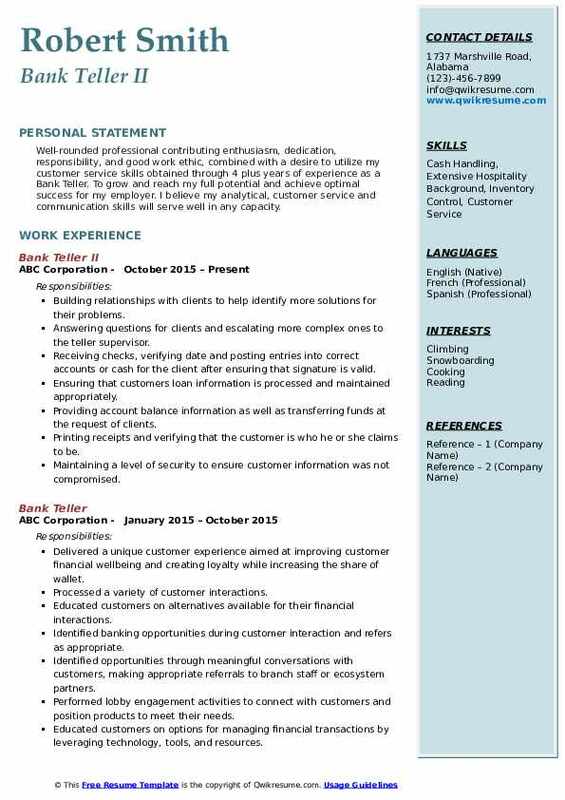 To provide such a type of service to customers, the following skills are needed – cash handling experience, exceptional time management, and customer service skills, basic math knowledge, strong sales skills, and high level of accountability, accuracy, and efficiency. A high school diploma is mandatory. Bachelor’s degree in relevant fields and on-the-job is preferred. 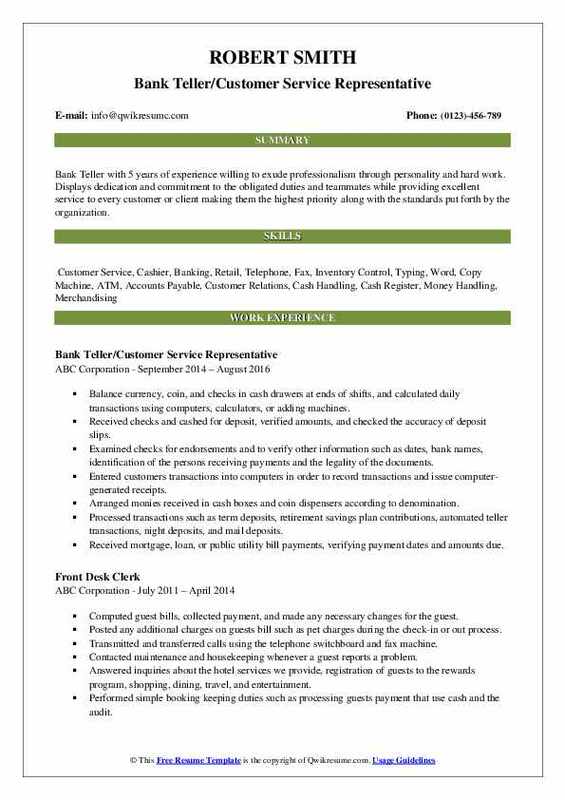 Headline : Bank teller supervisor with exceptional customer service and sales skills with a commitment to detail. Related skills include transacting and recording daily financial transactions, managing daily operations, customer relations, and management of employees. Able to train new and existing employees on company policies and new regulations. Familiar with Microsoft Office for scheduling and memoranda as needed. Skills : Productivity Software: Microsoft Word, PowerPoint, Excel, Outlook, Publisher, And Research. Answered telephones, direct calls, and took messages, performed loading, and unloading of the ATM. Responsible for the deposit, withdraw and loan payments both as a front and drive-thru teller. Provided fantastic customer service through clear communication and accurate transactions. Created sales referrals and promoted bank services and products, processed cash withdrawals, cashiers checks, payments for credit cards, auto loans, mortgages, a line of credit, etc. Proactively educated customers on utilizing available access channels. Performed many other branch bank services, including processing commercial and night deposits, food stamps, credit card charges, and savings bonds forms and reports. Processed a wide variety of retail banking transactions for personal and commercial customers. Provided courteous customer service, including referring customers to appropriate representatives for financial services, home improvement loans, annuities, trusts, and stock brokerage. Headline : Bank Teller with 5 years of experience willing to exude professionalism through personality and hard work. Displays dedication and commitment to the obligated duties and teammates while providing excellent service to every customer or client making them the highest priority along with the standards put forth by the organization. Balance currency, coin, and checks in cash drawers at ends of shifts, and calculated daily transactions using computers, calculators, or adding machines. Received checks and cashed for deposit, verified amounts, and checked the accuracy of deposit slips. Examined checks for endorsements and to verify other information such as dates, bank names, identification of the persons receiving payments and the legality of the documents. Entered customers' transactions into computers in order to record transactions and issue computer-generated receipts. Arranged monies received in cash boxes and coin dispensers according to denomination. Processed transactions such as term deposits, retirement savings plan contributions, automated teller transactions, night deposits, and mail deposits. Received mortgage, loan, or public utility bill payments, verifying payment dates and amounts due. Explained, promoted, or sold products or services such as travelers' checks, savings bonds, money orders, and cashier's checks, using computerized information about customers to tailor recommendations. 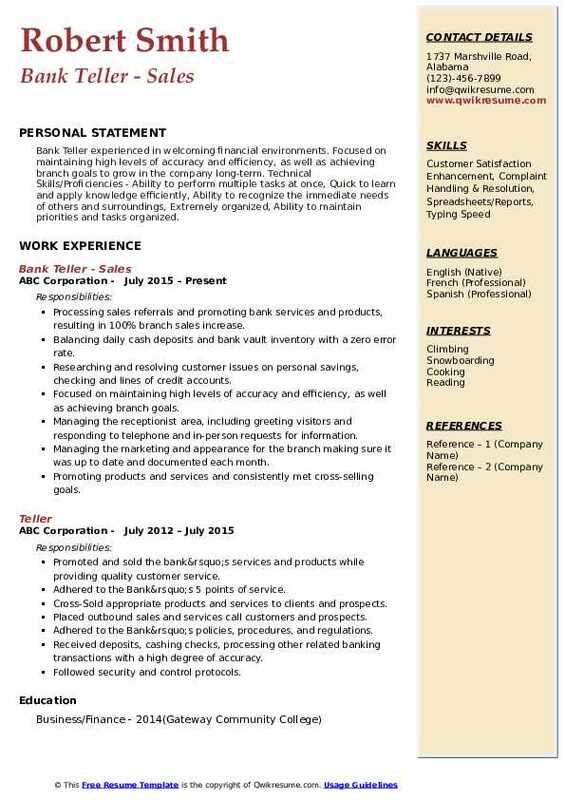 Objective : Junior Bank Teller, a fast learner dedicated to myself and employer with the ability to retain provided information related to my job. Interested in meeting/exceeding any and all goals set forth by. To obtain a position within an organization that will allow me to utilize my interpersonal skills, experience and willingness to help others. Helped to drive efforts in the financial center to identify and implement service behaviors that improve the overall customer experience. Primarily responsible for process transactions accurately and efficiently while acting within all bank policies and procedures. Listened carefully and connect with customers to understand their top financial priorities. Processed routine account transactions, and disbursed money to customers. Completed the company specified closing duties to prevent any burglaries or robberies from occurring. Informed customers about the bank product and provided them status data. Provided excellent customer service by answering or referring financial questions to correct supervisory staff. Required to disburse money as the customers write their checks on the accounts or withdraw their savings. Promoted bank products balance currency, cash, and checks in cash drawer at end of each shift. 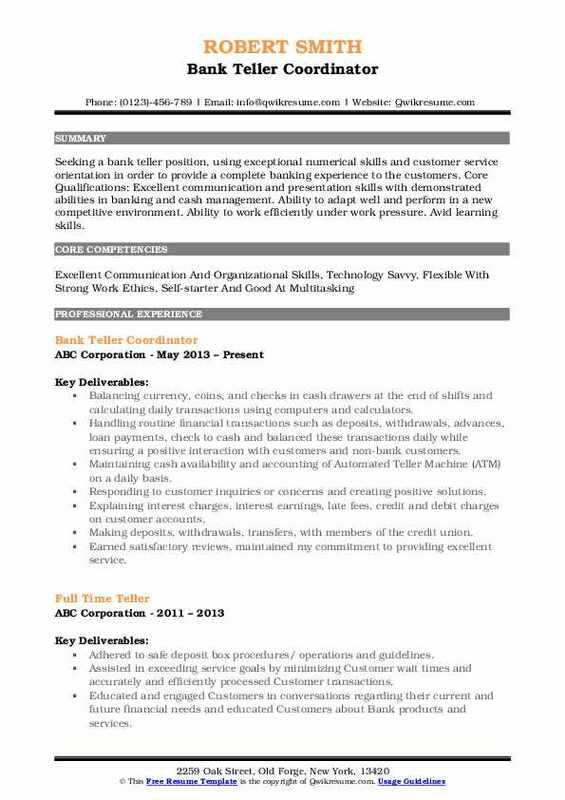 Objective : Well-rounded professional contributing enthusiasm, dedication, responsibility, and good work ethic, combined with a desire to utilize my customer service skills obtained through 4 plus years of experience as a Bank Teller. To grow and reach my full potential and achieve optimal success for my employer. I believe my analytical, customer service and communication skills will serve well in any capacity. Building relationships with clients to help identify more solutions for their problems. Answering questions for clients and escalating more complex ones to the teller supervisor. Receiving checks, verifying date and posting entries into correct accounts or cash for the client after ensuring that signature is valid. Ensuring that customers' loan information is processed and maintained appropriately. Providing account balance information as well as transferring funds at the request of clients. Printing receipts and verifying that the customer is who he or she claims to be. Maintaining a level of security to ensure customer information was not compromised. Recording transactions by logging cashier's checks, traveler's checks, and other special services. Maintaining customer confidence and protecting bank operations by keeping information confidential. 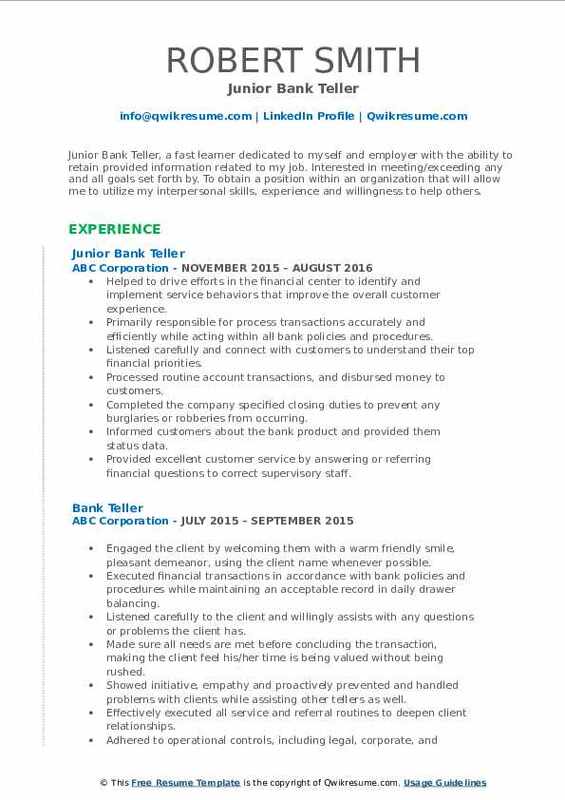 Summary : Strong work ethics, with over 7 years of experience as a Bank Teller. Core competencies include time management, the ability to get along well with others, excellent organizational skills, and the ability to handle, manage, and budget money. Completes tasks with accuracy and efficiency. Seeks to secure a chance for professional and personal growth and to put my knowledge and skills at work for the public. Ensuring customers/clients are quickly connected to the appropriate teammate with the expertise to meet their needs and to uncover products and solutions that will benefit them. Accurately assisting the customers in their transactions with withdrawals, deposits, money orders, cashier checks, and payments while maintaining a balanced register. Entering customers' transactions into computers in order to record transactions and issue computer-generated receipts. Cashing checks and paying out money after verifying that signatures are correct, that written and numerical amounts agree, and that accounts have sufficient funds. Receiving, direct and relay telephone messages and fax messages, transferring calls, page staff and maintaining voice mail on the main telephone line. Maintaining a pleasant office atmosphere be greeting guest in a warm and professional manner. Opening new accounts, certificates of deposit, money market accounts, safe deposit boxes. Issuing and redeeming money orders, official/cashier checks, traveler's checks, savings bonds. 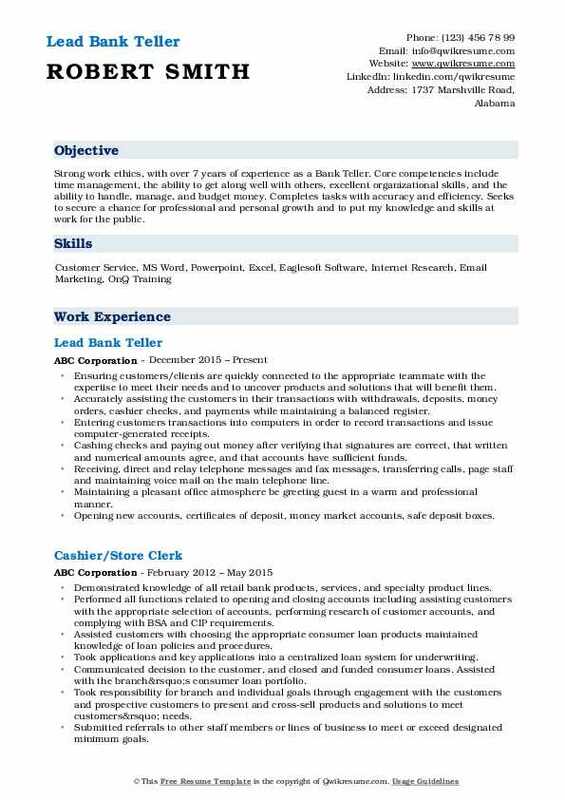 Summary : Seeking a bank teller position, using exceptional numerical skills and customer service orientation in order to provide a complete banking experience to the customers. Core Qualifications: Excellent communication and presentation skills with demonstrated abilities in banking and cash management. Ability to adapt well and perform in a new competitive environment. Ability to work efficiently under work pressure. Avid learning skills. Balancing currency, coins, and checks in cash drawers at the end of shifts and calculating daily transactions using computers and calculators. Handling routine financial transactions such as deposits, withdrawals, advances, loan payments, check to cash and balanced these transactions daily while ensuring a positive interaction with customers and non-bank customers. Maintaining cash availability and accounting of Automated Teller Machine (ATM) on a daily basis. Responding to customer inquiries or concerns and creating positive solutions. Explaining interest charges, interest earnings, late fees, credit and debit charges on customer accounts. Making deposits, withdrawals, transfers, with members of the credit union. Earned satisfactory reviews, maintained my commitment to providing excellent service. Maintaining the front desk and reception area in a neat and organized fashion. Summary : Bank Teller experienced in welcoming financial environments. Focused on maintaining high levels of accuracy and efficiency, as well as achieving branch goals to grow in the company long-term. Technical Skills/Proficiencies - Ability to perform multiple tasks at once, Quick to learn and apply knowledge efficiently, Ability to recognize the immediate needs of others and surroundings, Extremely organized, Ability to maintain priorities and tasks organized. Processing sales referrals and promoting bank services and products, resulting in 100% branch sales increase. Balancing daily cash deposits and bank vault inventory with a zero error rate. Researching and resolving customer issues on personal savings, checking and lines of credit accounts. Focused on maintaining high levels of accuracy and efficiency, as well as achieving branch goals. Managing the receptionist area, including greeting visitors and responding to telephone and in-person requests for information. Managing the marketing and appearance for the branch making sure it was up to date and documented each month. Promoting products and services and consistently met cross-selling goals. Identifying and resolving problems independently or cooperatively with seniors and managers.